North Harbor Drive, San Diego. 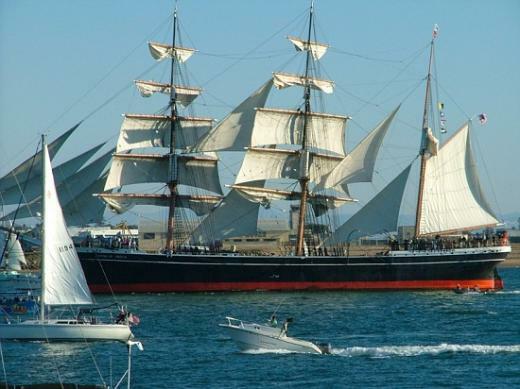 The Star of India is the world’s oldest seafaring ship. Built in 1863 at Ramsey Shipyard in the Isle of Man, it was an experimental design utilizing iron instead of wood. Launched as Euterpe, a full-rigged ship named after the Greek goddess of music, the ship’s initial voyages involved some rough sailing. Her first trip included a collision and mutiny. She came face to face with a cyclone in the Bay of Bengal on her second journey. Her topmasts cut away, she barely made port. Following that, the first captain died on board and was buried at sea. The waters finally quieted and it was smooth sailing during numerous uneventful voyages and several “change of owner” transactions. She served as a cargo ship to India, a passenger vessel hauling emigrants to New Zealand and a commercial salmon fishing and packing facility. Her name was changed to Star of India in 1906 and after 60 years of solid performance in 1923, she was towed to the San Diego bay. Saved from the ax or torch by concerned historians, she sat in port for over 50 years until funding helped renovate the tired old lady which was once a star. In 1976, the fully restored Star of India put to sea for the first time in fifty years, under the command of Captain Carl Bowman. She sailed beautifully that day, to the applause of half a million fans, ashore and afloat. Since then, the Star of India has sailed on numerous special occasions. Featured on Ghost Hunters syfy, and briefly on Dirty jobs with Mike Rowe .Reports of Voices below decks. Footsteps from unseen persons. Shadow figures. This vessel definitely seems to be alive from the past. One Response to "Star of India Ghost Haunt Spirit tour"
I was wondering if you have paranormal tours on the Star of India? Otherwise do you allow paranormal groups to investigate?